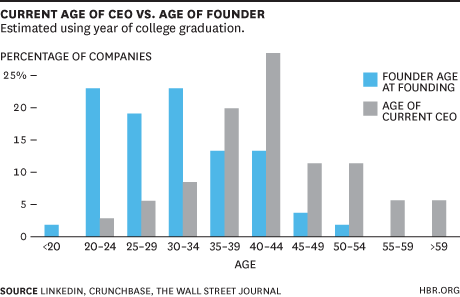 What's the right age to found a startup? 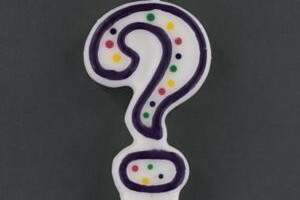 Do would-be founders over 30 have a chance? Reading news articles today, it’s easy to think that if you haven’t had a brilliant idea by 22, started a company by the age of 25, and received venture funding by 27, you’re out of luck. Well-meaning advice to jump into the startup game early abounds: “The guys with kids and mortgages are at a real disadvantage. This is one reason I’d bet on the 25 year old over the 32 year old,” said Paul Graham, Y-Combinator cofounder, nearly 10 years ago. Walter Frick at HBR analyzed founder ages at venture-backed private companies in the billion-dollar valuation club using data derived from LinkedIn, and estimated that the median age of unicorn founders was 30. In addition, 29% of founders on the list did not have any age-related data listed on LinkedIn, which could be because they are older than the ‘typical’ founder. 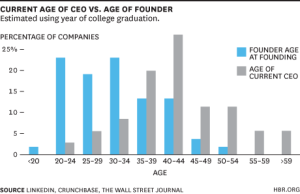 A similar analysis by Cowboy Ventures that included public billion-dollar companies discovered that the average age of founders was 34. 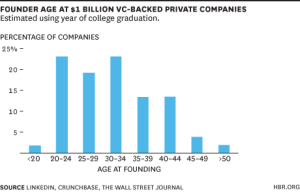 My hunch is that for certain groups of people, founding a company at age 25 is not practical. You may have student loans from college or advanced degrees; you may be saving money to buy a home with your partner; you may be supporting your partner through school; you may be caring for your aged parents or younger siblings. Women who want to have children may be particularly disadvantaged by the impression that a founder must be young to be successful. Saving money for the expenses of having children, taking time off work to actually have them, and ensuring you have a challenging role to go back to when returning from maternity leave – these are difficult things to accomplish even in the relatively stable environment of an established corporate job. But that doesn’t mean founding or leading a startup cannot be in your future. Going back to the HBR analysis, the average age of the current CEO was 42 for private unicorns, suggesting that VCs value experience when installing CEOs. The Cowboy Ventures analysis also revealed a startlingly high number in its dataset — 80% of unicorns have at least one co-founder who has previously founded a company. This prior experience included everything from tutoring to bagel delivery companies. So here’s my advice: Get practice starting things. 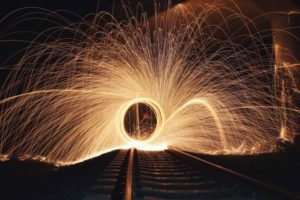 Whether it’s raising your hand for an entrepreneurial project at work or starting a new student organization, there are easy ways to bolster your credentials and prove you can lead an idea to execution through bounded experiments. Experience is a smarter route to becoming a successful startup founder than worrying about the number of candles on your next birthday cake. Great post with good data to back your comments. There is an interesting related phenomenon that I have observed in the VC industry over the last few years. 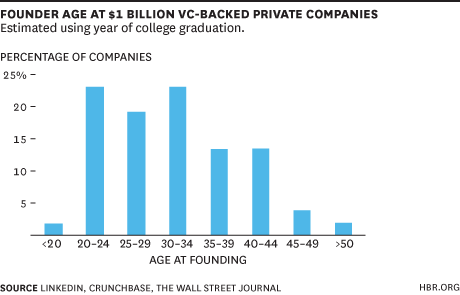 The declining average age of founders compared to a decade ago, has had a profound impact on the composition of VC teams. Some of the established VC franchises struggle to remain appealing to 20-something founders who prefer to take money from investors who they can easier relate to. The VCs response has often been to promote to Partners individuals still in their 20s, whereas a decade ago you didn’t have a shot at a Partner position until your late 30’s at the earliest, in the hopes that they will help generate stronger dealflow from the 20-something demographics. It is too early to evaluate the performance of these new breed of VCs but this poses an important question of the value of experience in the VC industry. Thanks for a great post Upasana! It’s always great to see real data on this kind of thing, helping us to cut through the media hype. I found the stat about 80% of unicorns having at least one cofounder with previous founding experience particularly compelling. It suggests to me that even if you do found a company at a younger age, you’re unlikely to be able to do it alone, and it seems likely that once VC money is raised, the board might be more inclined to give control to the older, more experienced hands. Interesting post! I have also met with a Japanese VC (focusing on seed round) of which managing director believes that the founders should be younger than 30 years old to make the ventures more likely to be successful. In your argument, I see two different factors mixed. The first one is the situation of the founder. The comments of Paul seems to be based more on the mortgage and the kids rather than the age itself. I understand that the older you are the more likely you have those two conditions but it is not always the case. Another factor is more toward age itself. For example, once you become older, it becomes more difficult for you to learn new things. Do you think the situation of the founders is more important or the age itself? This is a great post, Upasana. As an aspiring entrepreneur who doesn’t feel quite ready yet to found her own business and who is slowly but surely approaching her thirties, I found this post very appealing. I actually think that Paul is pretty on point. In my opinion, what he is trying to say is that when you are young you can afford to make mistakes and even lose it all because the consequences will affect mostly yourself. When you grow older and other people start depending on you it is harder to take that risk. But as you mentioned in your post, that doesn’t mean is not doable or that it is the “wrong time/way” of doing it. Let’s be honest, the perfect time might never come. Today it could be a student loan that’s stopping us, tomorrow it could be a child that we need to support. If we wait to have financial security before we take the plunge, it might never happen. So I think that it is necessary to be ready to make a move even in less than ideal circumstances. On another note, some entrepreneurs feel the need to learn more about the ins and outs of running a business before they start their own and they do so by working for other companies. Others are comfortable taking the plunge and seeing how it goes. I’m more in the first group of people and that’s okay. I think that one thing people like me can do to prepare is to carefully choose the types of companies we work for, the roles we take, and more importantly, the mentors we follow. There is an interesting interview with Jack Ma, founder of Alibaba, in which he gives advice to students and tells them to spend their 20s learning “how to do lots of things at one time” and their 30s figuring out if they really want to be an entrepreneur. I thought that timeline was curious since it is longer than what is usually out in the media, but I thought it was definitely an interesting perspective and one that I probably will end up following. Upasana – great post! As a 26 year old, even I (due to the public perception versus the facts that you point out) have felt that my “prime” to found a company is beginning to pass. Thankfully, you made it clear that I still have hope . I completely agree with your point that our goal should be focused on gaining first-hand experience versus playing the waiting game for that “great idea.” The experience can serve multiple purposes – not just to understand how to be a CTO or a product manager or what have you, but it also allows you to determine whether or not the startup life is for you. As a former consultant who has always thought about entering that space, my beliefs about startup life are solely based on the stories of others, versus my own. By jumping into the startup world, I’ll be able to determine whether or not it makes sense for me long-term. And if it does, well at least from a VC and co-founder standpoint, I’ll be a much more attractive candidate, as my experiences can help scale the company further and perhaps provide better negotiating leverage when it comes to fundraising. Fantastic post! Thank you for the thoughtful and data driven analysis. As an “old” person in his 30s, I naturally fall on the “strongly supporting” side of the age argument. The media hype around entrepreneurship and startups has created a false image many people hold true: the successful founder is in his or her 20s and works out of a garage. That image, although true 10-15 years ago, is now completely outdated. With its growing popularity and world penetration, the Internet has changed the game. Nowadays, the cost of starting a company or just trying an idea has tremendously decreased. 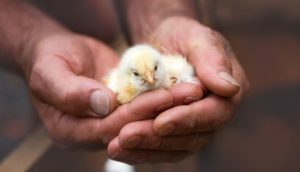 The change has opened the door for “older” people to try out the founding path in a much more efficient and effective manner. One no longer really need to quit his or her job (unless you see the traction you want) to put together a website or write a quick and dirty MVP. Therefore, it is only natural the success stories are evenly spread across the different age groups. I founded a company when I was eighteen and can honestly say, I sucked at being a founder. I knew technology and how to build a product but lacked any other managerial skills. Building a team, scaling, money management, hiring, the list goes on. I found myself figuring out everything as I went through the motions. Although possible to overcome, this steep learning curve is a major risk factor for both the firm and its investors. People like Paul Graham would say they want to back a 25 year old but what they don’t mention is the fact this young person is twice as likely to be fired from their own firm once the “real game” of scaling begins. I would like to think having a some actual experience in another company prior to starting your own venture is quite useful. It might box your creativity to some extend but it would also give you confidence and expertise to solve the problems ahead and avoid the common pitfalls.